Two Chinese missile frigates will enter the Russian Black Sea naval base of Novorossiysk for the first time in history. They will then conduct joint exercises with Russia in the Mediterranean. The Linyi and the Weifang will enter the port of Novorossiysk on May 8 to take part in Victory Day celebrations, according to the Russian Defense Ministry. Each is a 4,000-ton vessel of the relatively new Type 054A (also known as Jiangkai II), which first entered service in 2007. They are accompanied by a support ship. 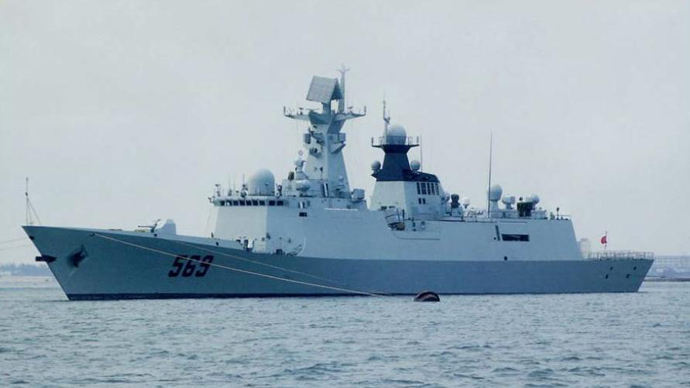 This is the first time Chinese warships will have entered the Russian base. The ships will then head to the Mediterranean for joint drills with Russian forces. "It is planned that the People’s Liberation Army Navy warships will leave Novorossiysk on May 12 and relocate to the designated area of the Mediterranean Sea for the Russian-Chinese exercise Sea Cooperation-2015," the Russian Defense Ministry said in a statement. The exercise will take place from May 11-21. Nine ships are scheduled to take part in total in the first drill of its kind to happen in the Mediterranean. The drills' goal has been stated as deepening friendly cooperation between China and Russia and strengthening their combat ability in repelling naval threats. The exercise comes at a time when NATO and its allies are holding a massive wave of military drills all across Europe. Collectively codenamed Operation Atlantic Resolve, NATO commanders and European leaders have said the training sends a message to Russia over its alleged aggression and the crisis in Ukraine. Some states are also conducting their own training maneuvers parallel to Atlantic Resolve. Russia has been conducting a series of military exercises within its territory throughout winter and in early spring, including massive drills in the Baltic Sea, Black Sea, the Arctic and the Far East.